Hide deals from seller "AMC Theatres®"
Hide deals from category "Movie Theaters"
$4 for an AMC Silver Experience™ Ticket ($10 Value). Mailed to Chicagoland Addresses Only. Includes a FREE Lifetime Subscription to print edition of Deals Magazine...Mailed to You! Must share once to purchase. Use share icons next to 'Get It' button. Cannot use Deal Dollars/account credit to purchase. Subscribers who purchased previous WhereYouShop/Deals Magazine AMC deal are ineligible. Ticket mailed via USPS to the Chicagoland shipping address provided when purchasing. AMC Silver Experience™ Ticket valid for 1 admission (valid 7 days a week). Good at any AMC Theatres, Lowes Theatres, Cineplex Odeon Theatres, Magic Johnson Theatres, Star, Showplace Theatres, excluding Canadian Theatres. Subject to surcharge in the Digital 3D, Premium and IMAX locations. Unauthorized reproductions not allowed. Please visit amctheatres.com for additional info. Relish the cinematic industry with an enhanced movie-going experience using this deal: $4 for an AMC Silver Experience™ ticket up to a $10 value. With purchase, you will also receive a FREE subscription to Deals Magazine, mailed to you. Deals Magazine will never cost you a penny, but will save you millions of them! Spanning 5,128 screens across the continent, AMC Theatres® has made its mark as the motion picture hub of the movie arena. AMC Theatres® launched its latest reward system in 2011, AMC Stubs™, which maximizes your movie-going experience, providing $10 for every $100 spent as well as free upgrades on concessions, among other benefits. AMC Theatres® also gives you convenience with its website, allowing you to read critic reviews, check movie times and watch the latest trailers online. Enjoy an entertaining family night, a romantic date or a comedic reunion with friends with this golden offer. AMC Theatres®, the AMC Theatres® logo and the AMC Silver Experience™ Ticket design are either trademarks or registered trademarks of AMC Entertainment®. AMC Theatres® is not a participating partner or sponsor of this offer. Distinctive and affordable movie-going experiences in 360 theatres with 5,128 screens across the United States and Canada. Allow 7 business days for delivery. AMC Silver Experience™ ticket will be mailed to shipping address indicated at checkout. 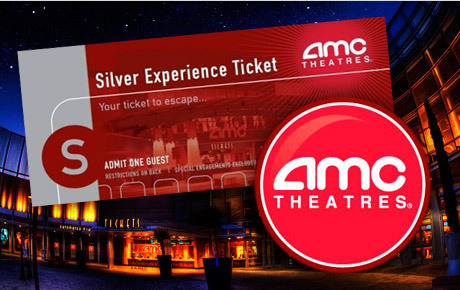 Once received, AMC Silver Experience™ ticket can be used at the AMC Theatres® location nearest to you.